Registration Open for 22nd Annual Jeff Clark Memorial Silks & Satins 5k on July 21. SARATOGA SPRINGS, N.Y. (July 11, 2018) — Saratoga’s sleek thoroughbreds won’t be the only competitors racing on Saturday, July 21, the opening day of the 2018 track season in the Spa City. At 8 a.m., more than 1,100 runners will congregate at the famous Fasig Tipton building (415 East Avenue, Saratoga Springs), the premier auction house for thoroughbred horses in North America, for the 22nd Jeff Clark Memorial Silks & Satins 5K. 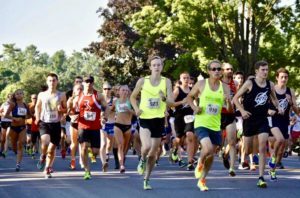 Proceeds from the run — a flat and fast certified 5K course which takes participants through some of Saratoga’s most beautiful neighborhoods — will benefit Special Olympics New York. “We are so grateful for the tremendous community support this race continues to receive,” said Jennifer Frame, director of development, Special Olympics New York. “Monies raised will enable us to enhance our sports programming, training and competition for our athletes. 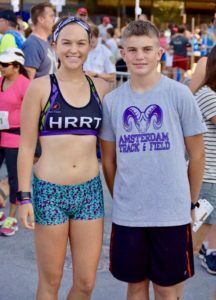 “One of the things we’ll be doing this year is incorporating our local athletes who live in Saratoga in various aspects of the race from manning water stops to presenting the awards,” she added. “In this way, people can really see the impact they have in supporting Special Olympics New York athletes. Registration for the chip-timed event is open at silksandsatins5k.com. The fee is $25 and the price increases to $30 after July 15. Day-of-race registration is available. Race bibs and shirts can be picked up race morning starting at 6 a.m. The first 1,000 registrants to sign up will receive a commemorative tech shirt, a free day pass into Saratoga Race Course, a free pass to the National Museum of Racing and Hall of Fame, as well as a shower pass to the YMCA. The event features a male/female and co-ed team competition. The awards ceremony will start at 9 a.m.
All participants are asked to bring a gently used t-shirt for the event’s collection box which supports backstretch workers at Saratoga Race Course. The Silks & Satins 5K is seeking volunteers for an array of roles, including course marshal, packet pickup, awards, water stop, start/finish line, refreshments, and event setup /tear down. For more information, please visit silksandsatins5k.com. Event parking is available in the Oklahoma lot across from Fasig Tipton at the intersection of Madison and East Ave., as well as on side streets. Special Olympics New York provides year-round sports training and competition in 23 Olympic-style sports to children and adults with intellectual disabilities at no cost to the athletes, their families or caregivers. There are more than 66,000 athletes and unified partners that train and compete with Special Olympics New York, the largest Special Olympics program in North America. For more information, please visit specialolympics-ny.org.